What’s available is what kids will use to explain their faith to friends. Answers magazine has decided to do some myth-busting. 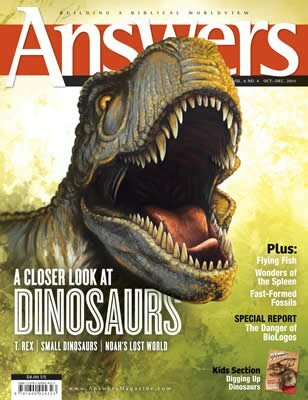 This issue will examine some of the most popular myths about the dinosaurs and how they died. Along the way, you’ll learn some other cool facts about these amazing creatures—quick, can you name the smallest kind of dinosaur? We will also examine some serious contemporary issues, such as the increase of biblical compromise in homeschool materials and the dangers of the new leader in “theistic evolution,” known as the BioLogos Foundation.